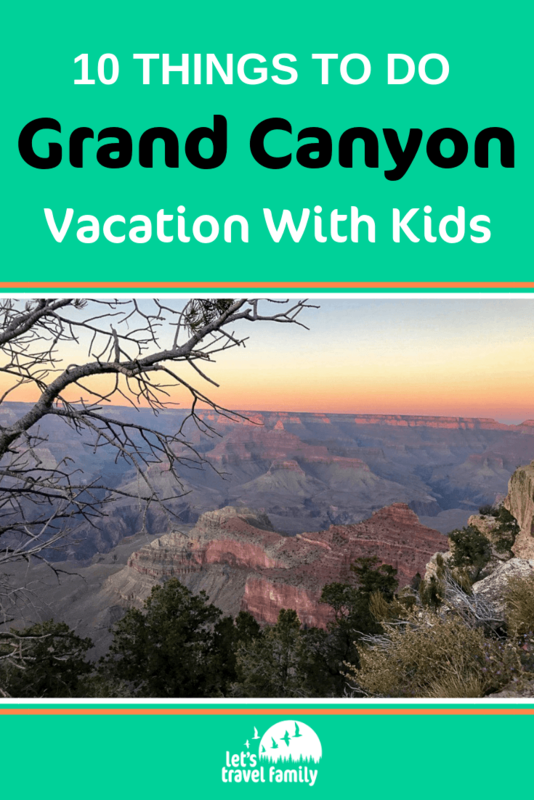 Visiting the Grand Canyon may have been on your bucket list all of your life, and now you are trying to plan your family trip. 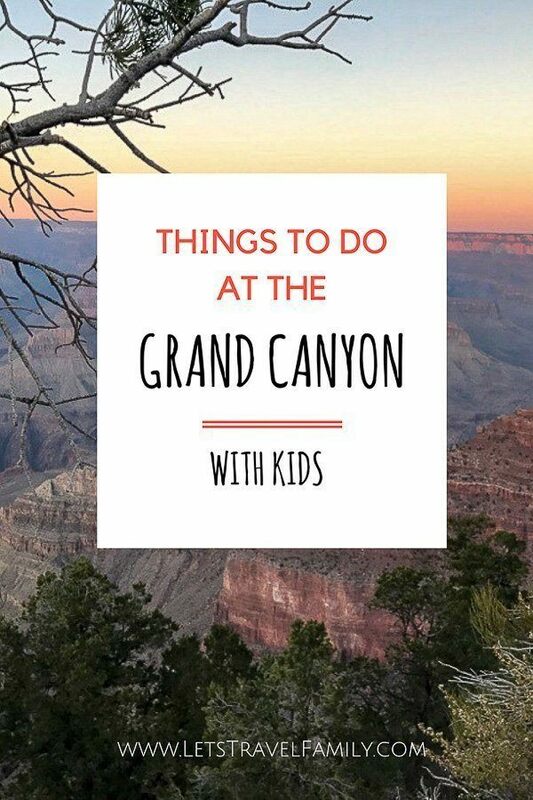 Yet, you want to know if visiting the Grand Canyon with kids is the best idea. Well, I'm here to tell you that it is! Our family of 6 thoroughly enjoyed visiting one of the Natural Wonders of the world together. Read on for what you can expect when taking your kids, tips to making it fun for the whole family, and suggestions on points of interest and places to stay. The most popular area to visit is the South Rim. The Grand Canyon's South Rim is located about 60 miles North of William, Arizona and 80 miles Northwest of Flagstaff Arizona. It's a 4 to 5 hour drive from Phoenix, Arizona, making it difficult to do a day trip to the Grand Canyon. There are not any large cities near the Grand Canyon so be prepared to stay in the National Park or in a nearby town. I recommend checking out Tusayan. It's a small city just outside of the Grand Canyon South Rim entrance that offers a few restaurants, hotels, and RV parks. If your family is able to take make the trip to see the Grand Canyon during the Spring or Fall, I highly recommend it. This way you can avoid the overly crowded summer rush and enjoy milder weather. If you do need to visit during the summer months, then I highly recommend booking accommodations at least 6 months in advance. Best case scenario, you are able to plan about one year in advance and can book accommodations inside the National Park. 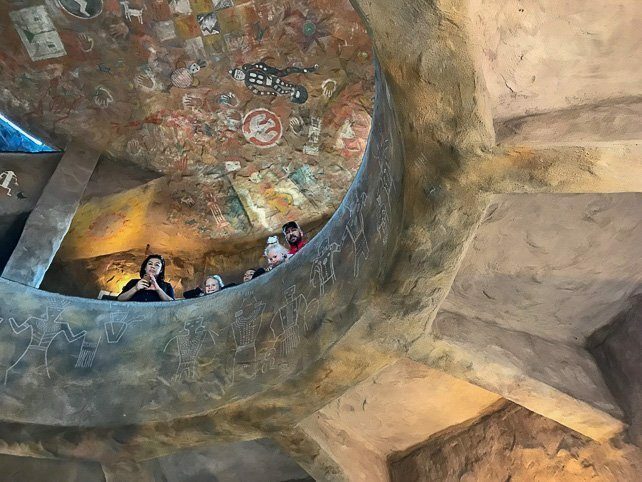 It will make for a better experience for the kids, require less driving for the adults, and allow your family to feel like you get everything you wanted out of your experience visiting the Grand Canyon. If you are not planning out an entire year in advance, no worries! You are much like our family then. 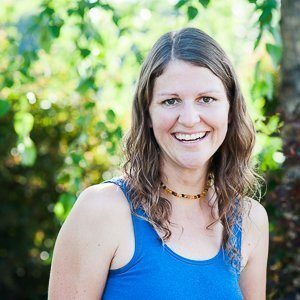 I recommend checking out hotel availabilities in the nearby town of Tusayan. Or, if you have an RV or tent and are willing to dry camp, then read on for the best kept secret about accommodations at the Grand Canyon! There is a great free place to camp less then a mile outside of Tusayan, that not many people know about. It's part of the National Forest and open to all. This is true boondocking though, so do not expect electricity or water of any kind. Nor are there reservations available or a host. You just show up and find your own campsite. Be prepared for some helicopter noise overhead during the day, as this camping area is in the flight path of the helicopter tours of the Grand Canyon. 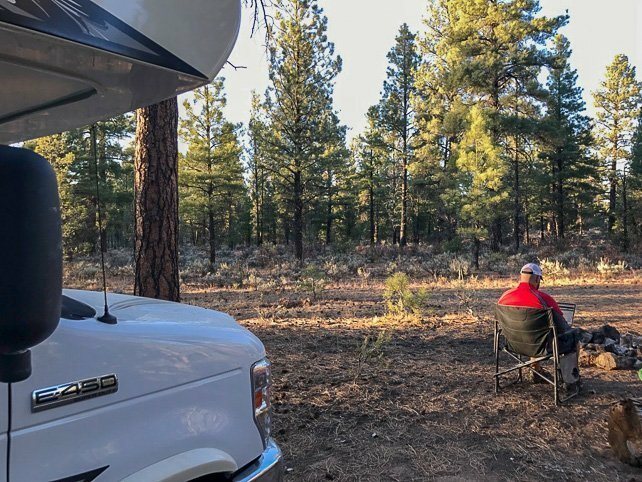 If you work full time while traveling, or feel like you cannot be without access to your cell phone service, then be assured that Verizon cellular service was excellent at our campsite. If you plan to hike, go on some family walks or hikes ahead of time. Purchase and bring a baby carrier for any children that may bolt or run away from you near the edge of the canyon. Get online and watch a few videos ahead of time! Read a great book about the Grand Canyon and bring it along with you. The first thing our family does at every National Park is grab the Junior Ranger booklet. They are usually found at any visitor center to pick up for your kids to complete while visiting the Grand Canyon. 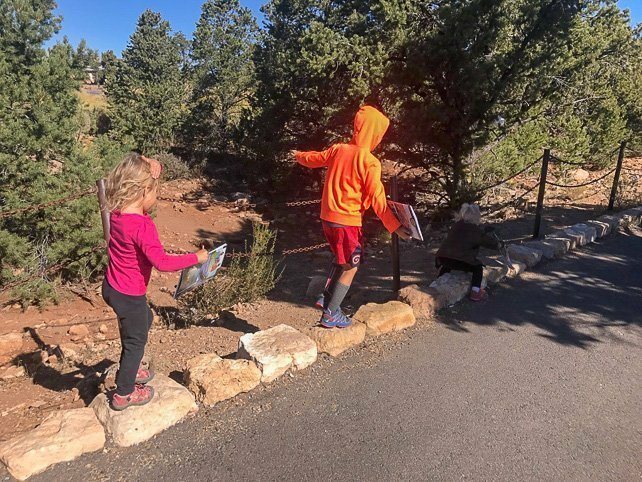 We picked our junior ranger booklets up from the Desert View Visitor Center as we came into the park from the East entrance. 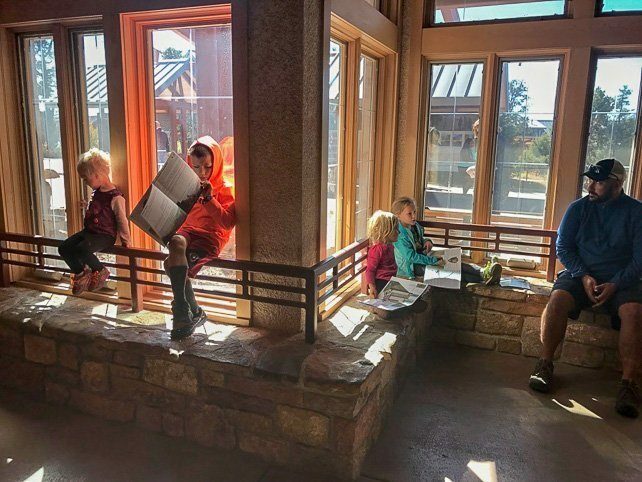 The kids were required to attend at least one Ranger program or watch the video at the main visitor center. Watch the educational video, talk to a ranger, or view all the artifacts they have on display at the visitor center. There is also a book and gift store along with a concession building with coffee and snacks right next to the main visitor center. We learned a lot about the Native Americans and got our first glimpse of the Grand Canyon and Colorado River coming into the National Park from the East. Take a Photo - But Be Careful! Taking a family photo by the Grand Canyon rim can be dangerous as there are places that people can fall right over. They actually do at times, so please put the young kiddos in a carrier or hold them and give yourself a lot of extra space before asking someone to take your family photo. Or, do what we did and stand many yards away from the rim itself. The blue line of the shuttle operates every 10-15 minutes throughout the day year round. It loops between the Grand Canyon Visitor Center, which ha a lot of parking, and the Grand Canyon Village. If you are planning to hike into the canyon, first determine how far your kids can hike and divide that in half. That's the distance you should travel down into the canyon, so that they have the energy and ability to get back up once you all turn around. 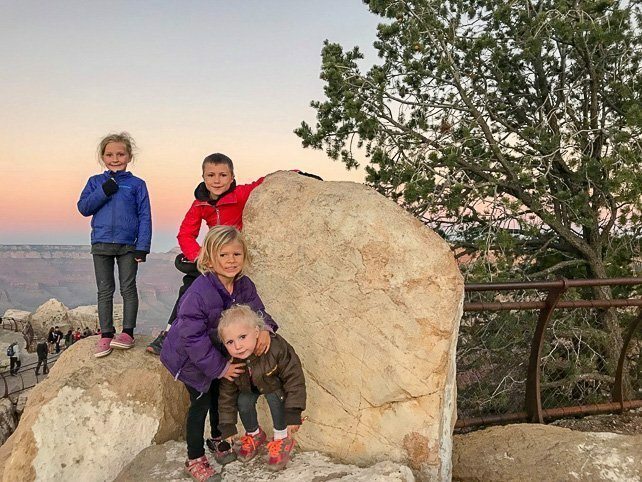 If you have little ones, then you can just hike the rim trail from the Visitor Center to Grand Canyon Village and back. Or, you could hike one-way and take the free shuttle back. 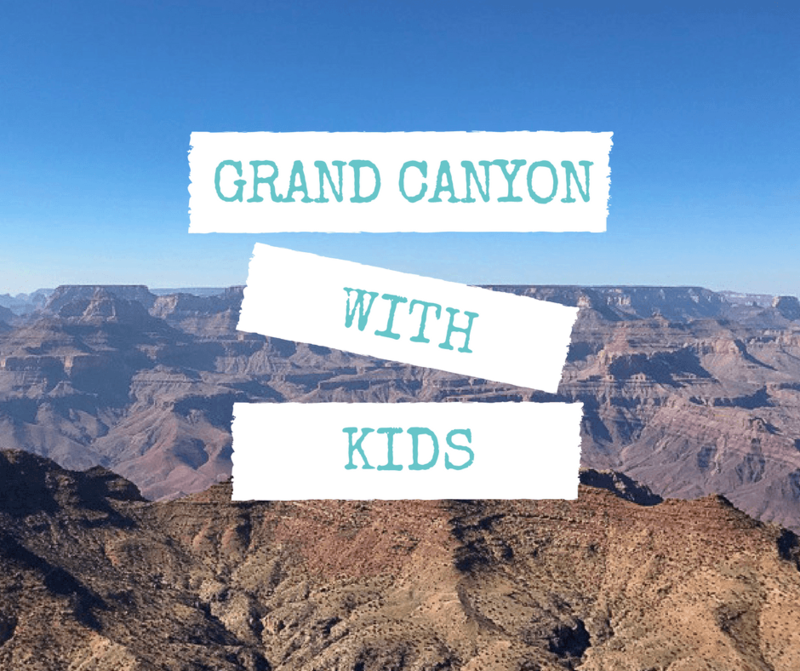 Visiting the Grand Canyon with your kids will not only allow you to mark something off your bucket list, it will be a great opportunity to spend quality time together as a family. We loved it and cannot wait to go back again. Make it happen! Build those memories that last and enjoy seeing the grandest canyon together. 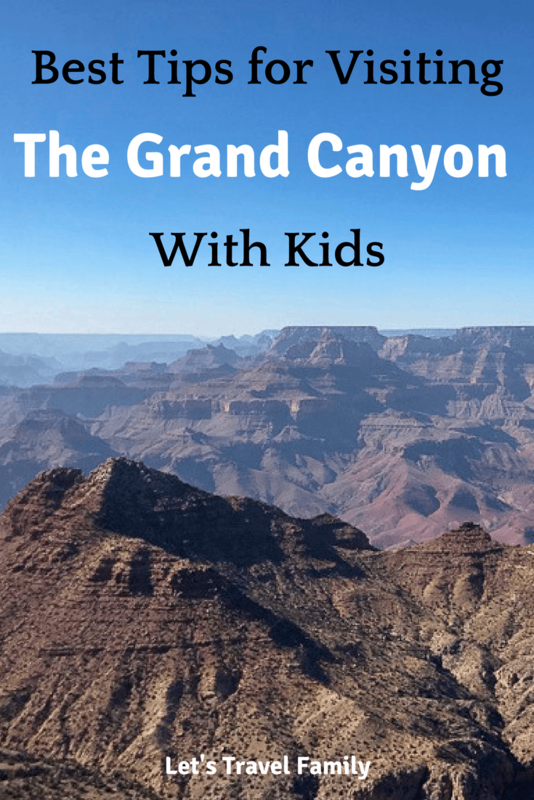 Do you have any other tips, suggestions, or questions about visiting the Grand Canyon with kids?